Kevin: I just want to start by saying I am so excited we're at this episode. Season 3 has already shown a sizable increase in quality, but I think this episode heralds a run of episodes that mark the height of the season, and maybe the franchise. I think it's easy to throw Q into an episode and let John DeLancie's natural charisma carry it, and fortunately, the writers did not do so here. We get a really great story focused on character development and interaction, as well as some nifty philosophical questions, not to mention some first rate comedy. Matthew: This certainly ranks as my favorite Q episode, which is saying something. TNG's Q episodes as a rule are quite good. One thing I really liked about the story was the "hard science" aspect. The task of saving a planet from a moon dislodged from its orbit is interesting. They use lots of scienc-ey words like "perigee" and Delta-V." The proposed solution had the benefit of sounding like something a fan would suggest, but then they make it "real world" difficult. Kevin: Q's interaction with the crew is simply comedy gold. I particularly enjoyed Worf's response to what Q has to do to prove his mortality ("Die.") is great, and the scene with Guinan was perfectly pitched. I like that she has a history with Q and isn't above a little gloating. It helps make the character a little more real and less one there just to counsel the crew. The best scenes, I think, are with Data. Data's self-sacrificing actions on Q's behalf really give the episode a nice emotional core, both for the crew's concern for Data, and Q's partial epiphany. Matthew: There were several laugh out loud moments, including he Worf scene you mentioned, Guinan stabbing Q with a fork, and the Mariachi scene at the end. This is definitely the funniest TNG episode so far, funnier indeed than the Lwaxana episodes. But just being funny isn't as interesting as melding a funny story with interesting ideas. This episode achieves that balance, while the Lwaxana episodes do not. Q got some great lines, as well, such as "Eat any good books lately?" Kevin: The set up of Q losing his powers is a nice twist on the omnipotent being story. It raises a question for me about the nature of the powers of the Q. Wouldn't true omnipotence mean he can't have his powers taken away? It's a bit like asking if God make a rock so big even He can't pick it up. In the end, I liked the idea because giving even a tiny, peripheral limit to the Q makes them more real. They are not merely the deus in our machina. They are a natural part of the natural universe, and have rules like everyone else. Matthew: Yeah, I find it kind of odd that the powers under the heading of "omnipotence" include the power to cancel omnipotence. Umm... Maybe it takes more than one Q to use this power? But then, they're not actually omnipotent individuals, are they? I can't say I thought about this during the episode, though. 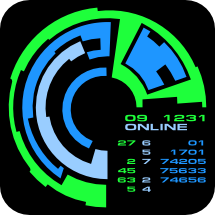 Speaking of weird ideas, how can the computer detect intelligence from the Calamarain, but establish no referents for even the most rudimentary communication (i.e. yes-no type binary statements). It seems to be that establishing intelligence requires referents - indeed, making any meaningful statement requires referents. Kevin: Something else I love about this episode is how it incorporates science fiction elements without making them the primary plot of the show. It's not wholly necessary to make the Q plot function, so it's nice that they did it anyway. Like Matt said, they did their homework with the science buzzwords, and it pays off. It felt like a real problem with a real solution. That being said, when I was a kid, I was a little worried about black holes moving at right angles to plane of our Solar System for a while. Matthew: That was actually the one part I didn't quite get. A black hole is just a massive body. It's a star that contains enough mass within a certain volume that its gravitational field traps light. But that doesn't mean it behaves any differently than any other massed object. If our sun were replaced (perhaps by a Q) with a black hole of the same mass (presumably it would be about the size of a beach ball), everything in our solar system would keep on happily spinning as if nothing were different. So why would right angles make any difference? Gravitational fields are omni-directional. Andre Bormanis, if you're reading, please explain! One more random note: the DS9 episode "Move Along Home" kind of ruined the alien name "Calamarain," simply by rhyming association. Not the fault of this episode, though. Kevin: Where to start? Good comedy is hard. I would go so far to posit that great comedy is harder to execute than great drama, and the crew certainly delivers. Picard has some awesome scenes. 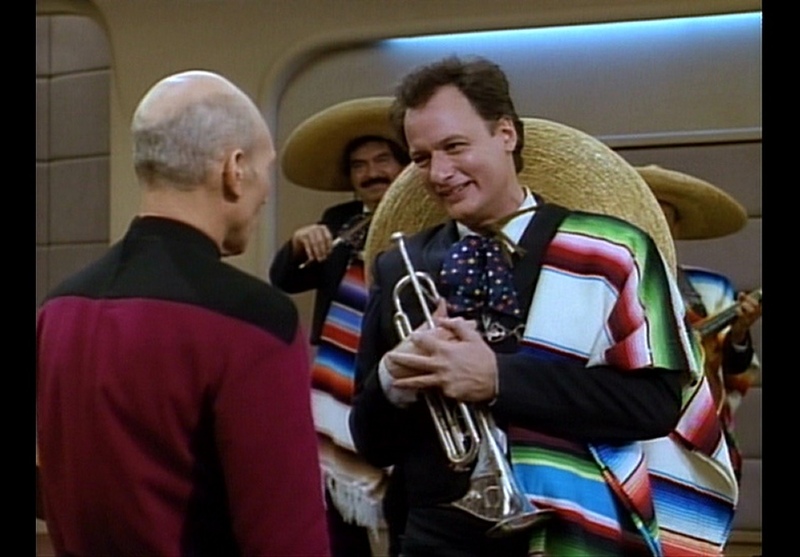 I enjoyed the ready room conversation and Picard's reaction the mariachis a great deal. Every time Worf says "Die," or Data repeats "trained little minions," I still crack up. I like that everyone gets a little jab in. It gave the episode a nice ensemble feel. It was also great to see Whoopi Goldberg do something other than serene detachment. Matthew: I have to say I found Guinan to be a little snotty. The "begging" line was a bit too much for me. Dorn got a lot of great lines and delivered them with the perfect pitch. In addition to "Die," he also had "Delighted, Captain" and "BE QUIET!" It was really a comedy stepping out for him and his character, and it was loads of fun to see. Corbin Bernsen gets a nice little speaking cameo as "Q2." I have to say, I like him in this role - pretty much more than in any other of his roles. It fits his persona like a glove. Kevin: John DeLancie really delivered. He's put a lot of effort in the past three years to making Q layered and three dimensional and it really pays off. Even when exhibiting unfamiliar character traits like humility or remorse, he still felt like Q. The patina of petulance never quite went away. Brent Spiner also did a bang-up job as Data in this one. Their scenes together were awesome. The actors should really get a spin off. I'd watch Brent Spiner and John DeLancie solve crime or manage an office of wacky characters. Matthew: I'm imagining Q and Data solving crimes in 1980s New Orleans, with Vash as the love interest. Anyhow, I found the Bre'el to be very Asian-sounding. Intentional or not? Well, they cast a lady named Betty Muramoto as the female Bre'el. This is the first in a long line of equating Asian people in Star Trek with aquatic creatures. OK, maybe not. But it sticks out to me for some strange reason. Kevin: The Calamarain were pretty good. It's a step up from previous iterations of "blobs of light" creatures. The effect of Q and Data enveloped in the Calamarain was pretty well done, and only mildly obviously an optical affect. Picking Q up off the ground was a nice touch. It added some real impact to what they were doing. But what was going to happen next? Were they going to squeeze him out a window or something? Matthew: One thing I notes was how nice the asteroid looked. Definitely the best asteroid in the franchise thus far. Exciting? No. Asteroidal? OH YEAH! Kevin: The shot of the Enterprise getting pushed into the atmosphere was simply fantastic. The texture on the new Enterprise model's hull with the friction affects looked realistic and awesome. The planet looked like a real world, too, which helped immensely. It was like looking at footage from the Apollo missions when the rocket boosters detach. It had that same feel, and it really made the scene. Matthew: Yeah, that shot of the ship entering the atmosphere was the best of its kind so far, way better than the one in "The Arsenel of Freedom." OVerall, this was a pretty strong episode on optical effects terms - with the exception of the very poorly lit Corbin Bernsen phasing through the shuttlecraft wall. Green (screen) Alert! Kevin: Was there ever any doubt? This is a 5. The episode deserves particular credit for taking what could have been an easy throwaway comedy episode, and added both some credible sci-fi problems and dialogue and some first rate writing and character development. People writing Lwaxana episodes, take note: this is how character-centered comedy with a bigger-than-life character is done. Matthew: Yeah, this is a 5. It is one of the most purely enjoyable shows in the series, just on its comic merits alone. But the fact that it adds both a nice character story, and even some science fiction, to the mix, makes it a keeper that remains enjoyable after repeat viewings. Is it the best of the series? Probably not. But it's definitely in the top decile. So that makes our combined rating a 10. This is one of my favorite episodes as well. I also like Data lines about Q becoming in disgrace what Data has longed for. Also how could you not mention the line about hot fudge sundaes. On a side note. I was doing a crossword the other day and the answer to a clue was arbiter. And the first thing that popped into my head was arbiter of succession. The best and most appropriate response for Worf in like the history of Star Trek "eat any good books lately?". LOLS Forever. The science makes no sense to me. They should have been trying to adjust the orbit of the moon at apoapsis not periapsis. They also used the wrong word perigee which refers to an object orbiting the earth. Periapsis is the correct term. Increasing delta v at periapsis will make the orbit more elliptical, and won't change the periapsis. Increasing delta v at apoapsis will make the orbit circular. Oh my god, thank you. I guess I'm not crazy for thinking the same thing. I was confused at this and can only assume it was a mistake. Bare in mind my experience from this comes from hours of Kerbal Space Program, but saying they'd attempt to increase the delta v at the apoapsis makes much more sense.